You can ignore those second-rate car rentals and pursue our professional line chauffeurs. We hand-pick each of our trained drivers to perfection. Enjoy the comforts of accountability and quality. Travel from Denver airport (DIA) to Cherry Creek Mall or hotels in style. Rest your eyes before work after that long flight. Take a moment to unwind before you unpack from your big trip. Denver Airport to Cherry Creek transportation insures you and your family’s safety with our integrity. 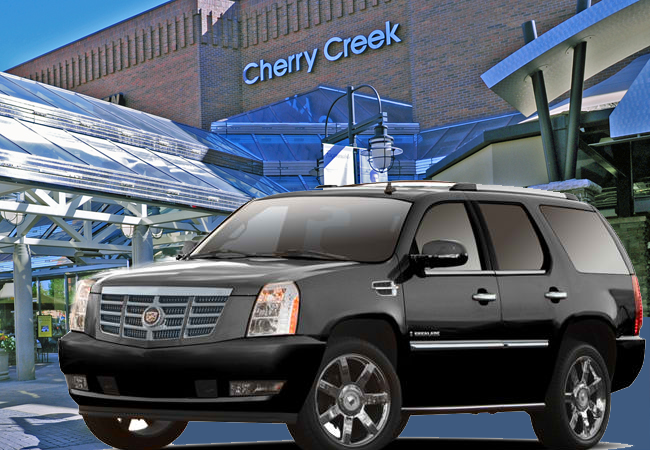 Our Denver Airport To Cherry Creek Transportation is your personal companion to the big city. Grab your outing by the reigns and tackle the sights and sounds. Give the manager an extra incentive to sweeten the deal. Show your partners you really mean business. Alert your customers to the success of a true entrepreneur by booking the best. Let us be your elevator to the top. Call now and don’t let another moment pass you by. Explore luxurious ride from Denver Airport To Cherry Creek in luxury to fit, Express Colorado Transportation presents the finest in first class accommodations and the nicest way to visit all of your favorite places. Need a ride from for work or business. Want to stop in at all the fancy shops and restaurants while on vacation. Denver Airport To Cherry Creek Transportation Services has your trip under control. We’ve got you covered from head to toe with premium luxury service at it’s finest. In our sophisticated pristine limousines you’ll feel like the king of queen on your journey around the fabulous little area known as Cherry Creek.Express Colorado Transportation is here to please and ready to meet your needs. Give our telephone representatives an informal call and secure your next ride aboard our famous new fleet of vehicles. Reserve your seat inside elegance worthy of Cherry Creek Town car and shuttle service. Travel in style and luxury with our Car Service Denver Airport To cherry creek. We cherish the moments you spend with the people you love and want you to embrace the extra time you’ll save inside our premiere limousines, sedans and SUVs. Take it from the company that offers more prized rides, throughout the Greater Denver Area, than anyone else.Call our specialists today and inform us of your needs. We’re ready and waiting for your important event.Denver has many options for transportation. But sometimes shuttles, buses and taxis just don’t cut it. Make a statement with your next visit to the city and satisfy the royalty in your blood, with an outstanding ride from Express Colorado Transportation.